This is the Slipstream micro camper that’s designed for compact cars and motorcycles to easily tow for traveling. It’s great if you’re a minimalist traveler because this unit ways only 200 lbs, it quick to set up, and it has about 38 cubic feet of extra cargo space too. 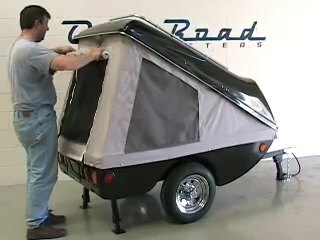 If something like a teardrop camper is too big for you but you still want the benefits of being able to tow a trailer for a quicker set up time and so you also have the ability to carry more cargo this might be a great option. It starts at $2,895. What do you think? For that price I would expect something a bit nicer than OSB inside. I like the luggage rack on top. Dave is right. I’m 5′ 9″, so this would leave me only an inch at top and bottom. With average heights going up in the American population, I’d imagine that a lot of people would find this cramped. Otherwise, I’d be sorely tempted to run out and get one! It would be perfect for my favorite camping spot, Assateague State Park. Easier and sturdier than a tent, less vulnerable to wind and ponies, but still well ventilated. And towable by pretty much anything. This is one of those trade-off situations. I’m a small person and have a small hatchback car, and get tired of trying to sleep in it. Fussing with makeshift curtains, never enough room because of traveling gear, and forget discreetly using the can. But sleeping in a tent when I’m traveling by myself is also out of the question for security reasons. Not sure about the stability of this thing in high winds, but the lack of weight and trim design should be a plus. Honestly I would rather camp in a tent on the ground which is so much more healthy for your body than cram myself into a little box. Too small. I personally think this little camper is perfect for someone not fond of sleeping in a tent with the bugs, or on the cold ground, or trying to set up a tent when you are tired, or when the weather is uncooperative. I’m 5’6″, so the length isn’t a problem for me, plus I have a VW bug that can’t pull much. It doesn’t need any whistles or bells, just convenience, needs to keep me dry, and elminates the need for a tent (even though I have one), or a hotel when I’m on the road. I think it is a great product. They seem to be much more popular overseas than in the US, but a compact camper I’ve often considered is a roof-top camper. A number of companies manufacture and sell them in the US, costs are similar to this trailer. They are relatively low profile when closed, and of course you save the money you would spend on trailer licensing and registration. Sleeping on a mattress in an enclosure over the roof of your vehicle is probably safer than being on the ground, and certainly more comfortable. I spent the last 40 years traveling through and tent camping on the ground in 37 states. Now as I age, I’d rather sleep on a mattress, although I can do that in a tent as well. I really like it and think it could work for me as I’m about 5’6″ tall. My backpacking tent is about as easy to set up quickly, but I’m still on the ground, and this camper would be much better when it rains. What I don’t get is the outrageous price tag on this and rooftop “campers.” They are just acrylic or fiberglass shells with minimal engineering. My bet is they have less than $500 in materials and labor in this trailer. Ok, they need to make a profit and cover engineering and development costs, so why not $1500? Harbor Freight has something similar (cargo trailer) for less than $400 (http://www.harborfreight.com/600-lb-capacity-78-inch-tag-along-trailer-66771.html). Almost three grand for this is insane. If I were in the market at this size and price range I’d be hitting craigslist for a small pop-up, or getting a 4 x 8 Harbor Freight trailer (http://www.harborfreight.com/1195-lb-capacity-48-in-x-96-in-heavy-duty-folding-trailer-62170.html) and building a deck for a tent. I bought a SportRack Cargo Box (made by Thule) for around $200 (on sale), and with some basic mods plus tent and screen material, I bet it would do just as well. Additionally, it’s over 7′ long. 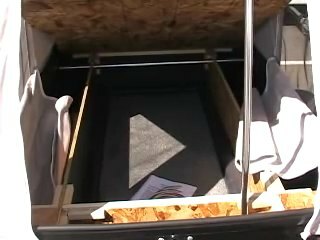 So, to recap, $2,895 minus a $300 trailer , and a $280 SportRack Horizon Roof Box (Walmart.com) leaves you $2315 left to buy a mattress and modification materials, with plenty left over to build a cargo “level” under the roof box and an additional modified roof box if you need or want for a friend. You may even have enough to pay someone to build it for you. There are just too many (more) cost effective solutions available to make this a viable product in my opinion. Thanks for the useful info. Dave B.!!!!! 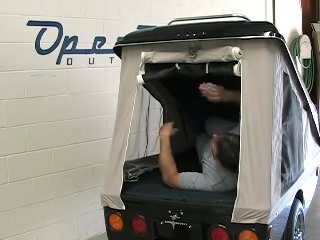 $3,000 for a tent on wheels. No thank you. I’m with Dave, get a slightly used pop-up camper. This one goes too far in the “compact” category for me. I have an Aspen Classic – very lightweight, but folds out a bit more…tons of storage – and a bonus for me is that you can literally get it set up 100% in less than 10 minutes. Check it out. Love mine. If you need to go “micro”. Think I’d feel a bit vulnerable, unprotected.